This morning Elle walked into the kitchen and saw I have “baking stuff” set out. 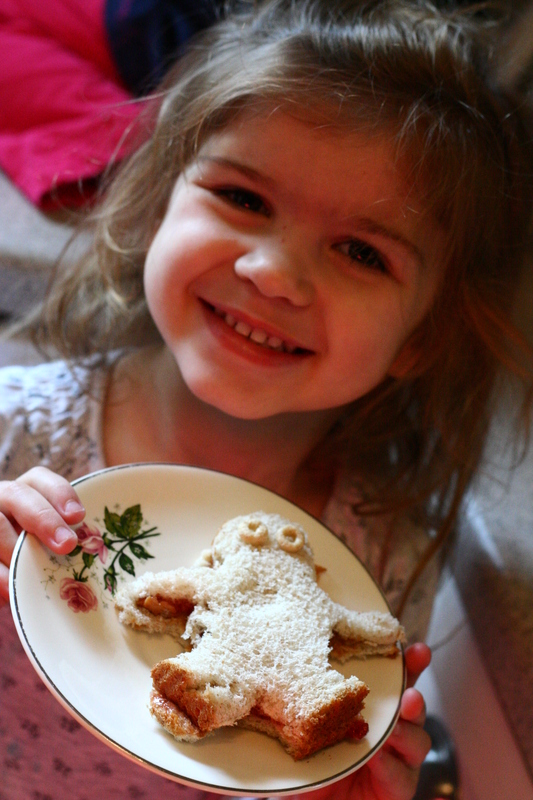 If there is anything she loves more then helping me bake– I don`t know what it is. For real, for her baking is a ministry. Funny, since I haaaate to bake. She was the little kid that said long ago, “Mom, let`s make cookies. They are so yummy and so special”. Groan. Did I mention I hate to bake? Anyways– did you have a good worship Sunday yesterday? I did. I have thoughts of the Persecuted Church, more dedicated mothering, and eternity and the reality of it, all there in my head together this morning. It`s funny though, how in my head and heart it all goes together. I feel God is gently asking me to change my heart and mind set in various areas of life. A few pics to close. “Before” picture of the hideous dresser I have been working on for the past week and a half– off and on. Still not completed! “After” pictures later. I can`t wait myself, for the clunker to be done. She is to be Laila`s dresser. 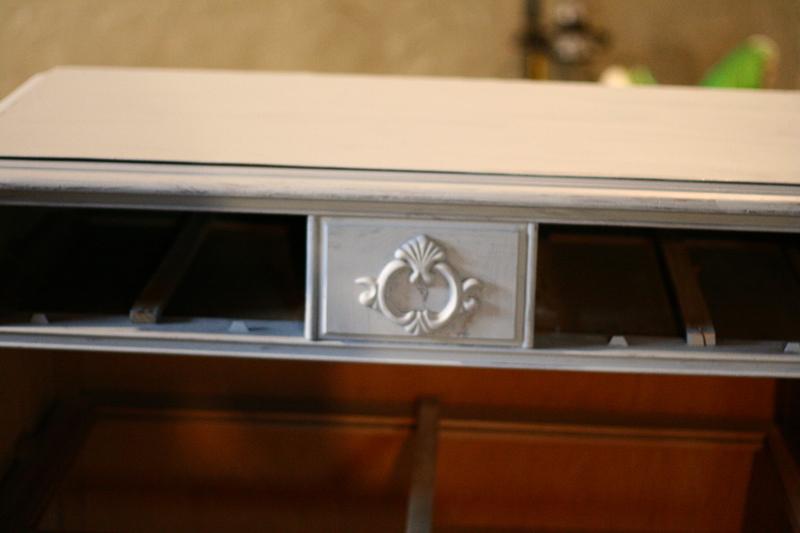 Here she is when she had only her first coat of primer on. Here is an idea for picky eaters like I have. 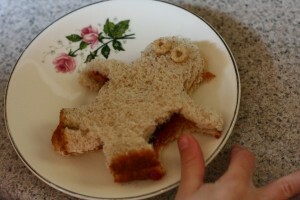 When I make a sandwich for Elle, if I cut it out with a gingerbread cookie cutter, she will eat it. Ptl. The dresser looks like it will be AMAZING!! Can’t wait to see the results! Hi, Jenny! I just love looking at my old friends blogs, the pics of their adorable kiddos, and what they are up to. I have heard so many raves about your blog and I must say, I agree! Your children are darling! My baby, Chase Daniel is 2 months today and he is so cute and sweet but pretty high maintanence. we are just busy with this business of raising a family, exhausting but so fun, too. I feel like I have quite a few irons in the fire, 2 schoolkids, a toddlers, and baby. I get absolutely nothing done. Some days that feels ok and some it so doesn”t. anyways, I have missed you and this was just suppposed to be hi. As always, I”m longwinded. So here”s wishing you and yours the happiest holidays ever! Hey, forgot to mention that that wasn”t Shilah! That was Kristy. elle is such a sweet soul. i have never, ever grown tired of pictures or stories of her. i live in quiet awe of all your projects. i am so stuck in the blah rut of ugly…and you? you just are always doing something amazing. love cute little elle’s face on that last picture. darling. So I just bought a bedroom set for my girls’ new room for $50. 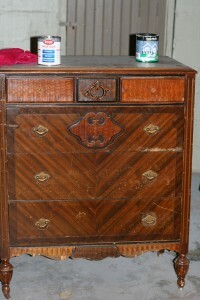 It’s a painted dresser set, in good condition, but almond-tan with hideous gold accents. What do I do? Prime it first? Would you use brush on paint or spray paint? You seem to be an expert in this field. What? You hate to bake. Now that really surprised me. But SO sweet of Elle to want to make cupcakes for someone. And I loved how you responded to her by pointing out the kindness in her heart. Awesome mothering moment there, in my opinion. I would love to get our little girls together to play again sometime, since last time they were what, 7 months old? Christmas is in my heart too…..
More this year than it has been in a long time. Thanks to healing and restoration in the making!